In this advanced three-day workshop, you will gain an in-depth understanding of the role and responsibilities of a Release Train Engineer (RTE) in the SAFe enterprise. Through experiential learning, you will learn how to facilitate and enable end-to-end value delivery through Agile Release Trains (ARTs) and value streams. You will also learn how to build a high-performing ART by becoming a servant leader and coach, and how to plan and execute a Program Increment (PI) planning event, the primarily enabler of alignment throughout all levels of a SAFe organization. Scaled Agile’s SAFe Release Train Engineer exam maintains rigorous quality standards ensuring that those who have earned the certification are well prepared to effectively fulfil their role in a SAFe enterprise. Make sure to read the Certification Information below. Attendees may be eligible to apply for 21 PDUs toward their continuing education requirement with the Project Management Institute (PMI) for PMP and PMI-ACP certifications. Renewal fee: $295. Renewal fee for the RTE certification is included in SPC renewal (if current SPC). To fully benefit from this class, you should have at least one current SAFe Certification, and, launched or participated in at least one ART and one PI. 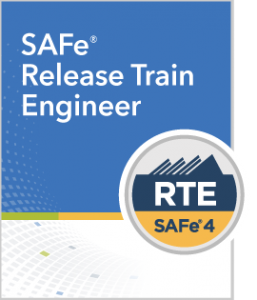 A SAFe 4.6 Certified Release Train Engineer (RTE) is a SAFe program servant leader and coaching professional responsible for driving end-to-end delivery of value in a single program or value stream in a Lean-Agile enterprise. This individual will be expected to perform these tasks with limited assistance from peers, product documentation, and support resources. Attendees must attend all three days in order to qualify for the exam. Third attempt requires a 10 day wait; fourth attempt requires a 30 day wait. Each retake attempt is $150. Contact support@scaledagile.com for any retake questions. Gladwell Academy Presents Release Train Engineer (RTE) Certification, Gladwell Academy is a SPCT Gold Partner with Scaled Agile Inc.